This is an elegant, classic piece featuring black agate - faceted nuggets and coins - and blue black baroque pearls that are are between 15 - 18mm in size. The pearls aren't top of the range in terms of surface perfection (hence the very attractive price of the necklace) but the lustre is amazing. 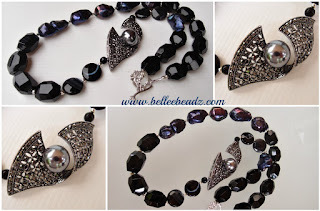 A marascite pave connector with an equally stunning silvery grey shell pearl adds to the gorgeous theme of this necklace. 23"/58cm in total length.